It almost certainly wasn't the clean sort of hit he would have imagined — after the game, he said, "Ten years from now when I'm telling my kids, it's going to be a line drive" — but David Wright became the all-time Mets hit leader last night, passing Ed Kranepool with 1,420 hits. It's not the most impressive list of players (freaking José Reyes is third), but it is something, nevertheless. In a lovely post that also points out that R.A. Dickey is, amazingly, 24th in wins all-time for the Mets, Jason Fry tracks the career of Wright, through the eyes of Mets fans. Since [Wright's first game in 2004] we’ve seen him as a young player with a precocious grasp of the strike zone, as Cliff Floyd’s good-natured foil, as a dreamer fulfilled spraying Champagne on fans with a soaked cigar in his teeth, as the designated facer of media music after two collapses, as the agonized poster child for Citi Field’s too-distant power alleys, as an anxious leader disastrously expanding the strike zone in an effort to accommodate the weight of the world on his shoulders, as the endpoint of a horrifyingly errant Matt Cain fastball, as a revived presence at the plate and at third base, and as who knows what next. This all begs that exact question, of course: What next? The Mets are expected to pick up Wright's option for next year, but then he's a free agent, and as Fry points out, whether or not he comes back is not entirely the Mets' decision. But for now, we can look at Wright and see him already atop the team's leaderboard in hits, RBIs, walks, runs, and doubles, second in at-bats, and third in homers and games. Maybe he'll re-sign and put all those numbers out of reach. 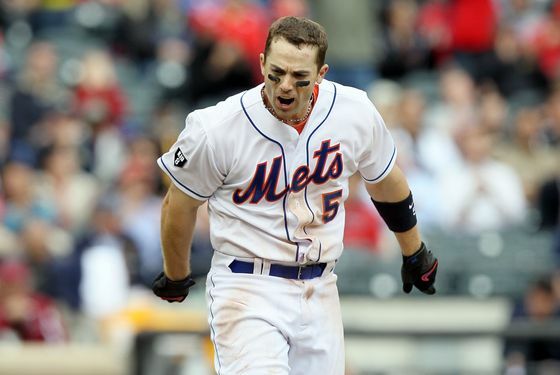 It's the single signature question of the next twelve months of the New York Mets. But there will be plenty of time to worry about that. Today, he's just an all-time Met.